Then I read of a children’s book called Me...Jane by Patrick McDonnell about Jane Goodall's work with chimps in Africa--probably in the New York Times Book Review's round-up of kids' books. So last fall when we were visiting the Strand bookstore in New York, I found a copy for my granddaughter. It’s very cute and a great story about an amazing woman and her message about what we humans owe to the other species we share the planet with. I hope Dorothea loves it when she gets a little older. And then the movie "Jane" came out this fall. Of course John and I went to see it--an excellent documentary about a remarkable woman. See it if you get a chance, and take the young people in your life to see it too--such a great message about our obligations to other creatures on this earth. 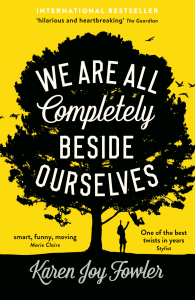 And then I started Karen Joy Fowler‘s book We are All Completely Beside Ourselves, which my sister had raved about eons ago. The story contains a chimp. I will not say any more for fear of spoiling the story, but I loved loved loved this book. I called my sister to tell her how much I loved it, and learned that my niece by marriage, Hannah Canter, who works with her mother, Marta Kaufman, at the production company Okay Goodnight, has optioned this very book for a screen adaptation. I would be so excited if this book was developed into a movie! So strangely enough, a chimp theme runs through my life. I don't know what it means or why it's emerged, but I couldn't resist sharing it during this busy week. Can you put your finger on any themes that have appeared in your life? Do you have unusual causes you support? I love the chimps! I need to check out those books . . . . Themes that have appeared in my life? My children would tell you stars and space . . . .
Joan, tell us more about stars and space! There’s really not much of a story, Lucy. Like many kids growing up at the beginning of NASA’s manned spaceflight program, I enjoyed following the various missions. When I was teaching, I borrowed moon rocks from NASA and put together a program to teach the children about the history of manned spaceflight and, of course, to find out about going to the moon. Naturally, everything got tried out on the girls first [including moon shoes]. And just to keep it interesting, aerospace education was responsible for John and me meeting each other in the first place . . . . It is funny how things pop up in our lives, isn't it? Can't think of anything like that in my life right now. 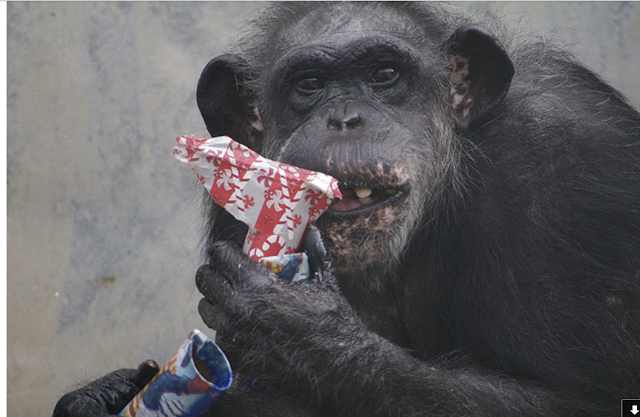 Chimps are fascinating to watch, Lucy and I love those photos and books! I have a close affinity to giraffes. I remember feeding my first giraffes while visiting the Cheyenne Mountain Zoo in Colorado Springs and I was hooked. I know that I am not the only one: look at how many people watched April the Giraffe give birth on-line this year! This obsession became a bit of a joke at work and people started giving me stuffed giraffes, giraffe scarves and brooches as gifts. Themes...don't think I have any accidental ones. With hubs it's owls. Ceramic ones, paintings, etc. I asked him about it when we met. He couldn't explain it, said people seemed to think he needed owls in his life. Bit my tongue on the snarky easy remark. Took years before the penny dropped. He's a Temple alum. He never made the connection either, but somehow, those Temple Owls have followed him through his adult life! When I look back on my life up to know, I realize I have always been a writer of one kind or another: journalism, academic writing, essays, memoir, technical writing. I guess I was getting myself ready for this last career of fiction author! and who says it's your last career, Edith?? No odd themes at the moment, but a few years back there was a particular CD cover I kept noticing over and over and over again. The CD was called "Grant Street," by a guitarist named Sonny Landreth. I first noticed it in a review I saw shortly after the CD was released. I asked Warren if he knew anything about the artist, and he said Landreth played slide guitar. I promptly dismissed it, since I didn't really like the kind of gut-bucket slide blues I'd always heard. But I kept seeing the CD--in reviews, in ads, in all kinds of odd places. I'd think, "Oh, that looks cool. But, right, it's that slide guitar guy." A few months later, Warren was gone, and I was desperately looking for new music, because all the old familiar stuff reminded me too much of my loss. I was poking around a Barnes and Noble, and there was the "Grant Street" CD. I bought it precisely because it had been haunting me for so long. It blew me away. The music was unlike anything I'd ever heard before, and I wound up flying halfway across the country to catch Landreth in concert. That trip not only built my confidence in my ability to navigate on my own, it set me on a path that is still enriching my life twelve years later. Now, I pay attention when the universe keeps drawing some particular thing to my attention. Me too, Lucy. And it so piqued my curiosity that I now have the CD playing over YouTube while I finish reading today's blog! It is a unique and wonderful selection. Thanks for the intro, Gigi! You're welcome, Susan. I'm glad you like it. Sonny is one of those guys who spent most of his life perfecting his art and playing in relative obscurity. Only in the past ten years or so has he begun to get the wider recognition he deserves. Now they're starting to call him a legend. Gigi, I think there is a border collie theme in there somewhere, too, starting with finding Liam that day by the side of the road. Who could have guessed what that chance encounter would lead to? Themes... With me I guess it would be birds. I'm tuned into them wherever and whenever I'm out of doors, or just listening from indoors. We have bird art. I counted them just now: 9 prints, paintings,collages, carving! Wherever we go we carry along binoculars and a guide to the birds in that area. But please NO ONE start giving me ceramic birds. They don't get into my books... except wait! There are some carved bird decoys in the new one... which I do believe will turn out to be a clue if I ever figure out how it all works out. Birds. Every room in our house has something to do with birds, either photos or paintings or prints or sculptures of some kind. Not to mention calendars. I've been trying to move away from having a house that feels like an aviary. Not that I'm ungrateful for the life that my husband's bird photography has given us, but enough is enough. HA HA, I don't want any ceramic chimps either Hallie! As I was reading, I was about to recommend Fowler's book! Love this theme. My sister is especially concerned about bees, so I always give in her name a donation of a Bee Hive through Heifer, Int. And I get her something bee-related -- honey soap, candle, etc. I had a cow period which started when a woman I taught with, who had grown up in Manhattan, learned that I raised a cow. Then others started contributing! In a couple of moves, I got rid of most of the Holstein stuff, except for a paper mache cow that flies from my bedroom ceiling. These days it's all about angels. Love Heifer, Denise--it's such a worthy cause. And it makes sense that themes would emerge and recede over time, doesn't it? Denise, your story sounds a bit full circle: from all your Holstein stuff to the Heifer Project and how through donations, you are one of those angels. Blessings. For me, I think the theme has been reinvention. In the last couple of years I've replaced a hip and both knees, leading to a great reduction in the chronic pain that plagued me for a long time. This October, I had a certain birthday, and was delighted to confirm that yes, she still needs me and she'll still feed me ;-) The following week I retired, and the next day we took off on a trip that included buying a house that's closer to both my parents and our grandkids. We'll be changing states for the first time since we married in 1978, making new friends, finding new doctors, barbers, grocery stores, and all that. We've gotten rid of a lot of stuff in the process, which feels freeing in a very good way. So I'm really at a point where I've loosened or discarded all sorts of attachments (some painfully--we will miss a lot of our friends here) and can decide which new ones to make and what to do with my time. It's both sorrowful and exciting. Jim, that's exciting. And then--off to the Isle of Wight, if it's not too dear? Exactly. We shall scrimp and save. But I can't figure out how to make that rhyme with Kennedy and Becket. HANK here: oxxooo Love you! For awhile it was fans: silk, feathered, wicker, you name it. Then it was trivets: rattan, ceramic, iron, pewter, silicone. My mother used to give me an angel every Christmas, because she said I once told her I like angels. I have no idea who told her that, but it wasn't me. She also said "my" favorite color was purple. It was my sister. Never mind that everything she gave me for years was purple. And yes, at least one purple angel. That is such a perfect family story! LOL Karen, I hope you had a lot of kids in your family to explain the purple mix-up! Only four, and just the one sister! Oh, gosh, so fun! I don't have a theme, except work. (:-) ) But! Here's a story. My co-worker Mary went to California with her boyfriend to visit the wine country. The day before the wine country fires. Ah. They couldn't go, of course, and had to stay in someplace like Pebble Beach with Mary's snazzy friends. Because the wine country trip was canceled, Mary and Peter were able to go to the snazzy friend's party, which, otherwise, they would have missed. Turns out, the entertainer for the party was Dave Matthews. And: the guest of honor, with whom they were seated at dinner...was Jane Goodall. Wow! That's two degrees of separation! Or maybe one! HANK here: Yes, amazing. Mary has many stories! Like you, Jim, I've reached a time in my life when I feel the need to get rid of attachments. One of mine is/was jewelry. Last night I was remembering the Christmas that my mother gave me her diamond earrings. I'd longed for them for years. All my friends but me had them. I had even given Julie a pair for a birthday and had "upgraded" them a few years before. And then I got older, started looking thru my jewelry and thinking about my daughter. So I offloaded everything of value to her, topping it off with an antique ring, three large diamonds, greater than a carat each, arranged in a row like a stoplight. And the next year, I gave my granddaughter the diamond studs. All I kept of value were a couple of rings, the gold locket my grandmother gave me, a lovely gold bracelet, one of a kind made by a local goldsmith, and a ridiculous assortment of earrings, even though there are only a few pairs that I actually wear. I do remember longing for a tennis bracelet, which I never got. Do people still wear those? Just as well since I would give that away too. I'm a bird watcher, and have bird figurines and prints here and there. Alas, I've never gotten around to framing the prints. Years ago I started collecting angel figurines, long before it was a "thing". Until last year I had not gotten a new one in a very long time, but I saw one that "spoke" to me. And of course books have always played an important role in my life! They entertain me and inform me, and keep me sane! Oh absolutely, books! I think we all have that in common. What a wonderful charity, Lucy! I can't think of any themes right now, other than how fortunate I am to have smart, funny, talented friends all over the country! And we all return those feelings to you Julia!! Lucy, We Are All Completely Beside Ourselves is one of my all-time favorite books! And, it's one of those books that you can't say much about when recommending it because you don't want to spoil it. Simply, "you have to read this book," or "please read this book" will have to do. I'm always delighted to hear that someone else has loved it. Hmm, themes? Most themes are self-inflicted for me, such as goats and gnomes. Of course, books and book related materials are a consistent theme of my life. Lucy, I had no idea about you and the chimps! You know I majored in biology, right? What started all that for me was reading books about animal behavior when I was a teenager, including Gerald Durrell's fabulous books, now made into the TV series, The Durrells on Corfu. But I also read Konrad Lorenz and Louis Leakey and everything I could get my hands on about by and about Jane Goodall and Dian Fossey. I was convinced my destiny was to go to Africa and study primates. I admire Goodall tremendously and am so envious of Karen's friends at the party!!!! I didn't know about the movie bio so am looking up asap. Lots of themes in my life! There is, of course, the English theme. I live with English things everywhere, from teas to books to my collection of London Transport Posters. There is a bird theme, especially hummingbirds. And a German shepherd theme! I would never have guessed, when our cocker spaniel died nearly twenty years ago, that I would be spending the next few decades of my life with a house full of German shepherds and German shepherd stuff... Not that I'm complaining, mind you. D'oh! I had no idea that the Durrel's in Corfu was based on actual people, and of course the youngest is a gonzo naturalist. Going to get his books right now. "My Family and Other Animals", was the first, I think, Hallie. I had all of them. Debs, make sure to get the Me...Jane book for Wren! Oh, my goodness, I love these pictures. Lucy, how fabulous that you have found the chimps and and vice versa. My old boss joined the Peace Corp and was in Botswana for two years. This hooked me up with the organization Books for Africa. So now, when I get my author copies, I send them on to her to share with her people as well as sending contributions so that they can buy even more books! It seems to always come back to books for me! Lucy, there is a new movie about Jane Goodall. Sounds like a great organization to help chimps. There is another organization that I like to help when I can.